The #PayFair logo. The campaign aims to outlaw late payment of bills. A new campaign has been launched to outlaw late payments in a bid to save hundreds of Peterborough companies. 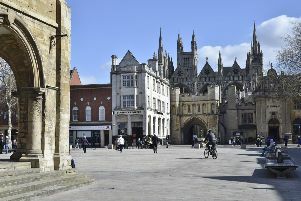 Called #PayFair, the initiative aims to make Peterborough a no-tolerance city for the late payment of bills among companies. It asks firms to commit to paying on time. Figures show that 620 Peterborough companies closed last year - 20 per cent of those due to insolvency caused by late payment of bills. The campaign was officially launched at a gathering of business leaders at regeneration company Opportunity Peterborough’s Bondholder breakfast. It is idea of Maurice Power, managing director of Ferguson Financial Solicitors, of Fengate. He said: “One in seven businesses in the east of England have invoices that are more than 30 days overdue – that’s almost 1,000 businesses around the city. “Peterborough is a great place to build a company, but the fact that 600 are forced to close every year is very sad and unnecessary. “Small businesses don’t have the time or expertise to chase their debts, which is why they’re so often exploited. Peterborough’s business community reached 6,900 companies in 2014 - up 300 on the previous year and included the launch of 990 new companies. But 620 Peterborough businesses closed their doors that year. Twenty per cent of corporate insolvencies are caused by late payments, many local business closures are avoidable if customers simply pay their bills on time. Mr Power said: “We advise local clients on how best to handle late payments and it’s shocking to see how prevalent this is in the city. “We’re calling for a culture change in 2016.